What is Elimiation Communication and Diaper Free? Whatever you want to call it is a gentle, natural, non-coercive process by which a baby, preferably beginning in early infancy, learns with the loving assistance of parents and caregivers to communicate about and address his or her elimination needs. This practice makes conventional potty training unnecessary. When can you Start EC? You can start EC from birth, and to be honest I wish I had with Isabelle, but its never to late and were going to throw ourselves into it now. We started EC with Isabelle around 9 months. Does this mean you don’t use diapers at all? A Diaper Free Baby celebrates the ability of babies to be “free” from (not dependent on) diapers and does not require or expect all families to avoid the use of diapers altogether rather using clothing and/or diapering system that best allows them to pursue communication about the child’s elimination needs. As we do it part-time. That is when we are at home we do diaper free. We use diapers at night and when we are out. Slit pants and Leggings I decided to go with Leggings for now! And have purchased a set of four to get Issy and I started! Hug-a-Lugs are great to keep your bubs legs warm when nappy free. I also use big girl pants on Issy at home if its a bit cold by Bright Bots ( these have a little plastic in the crotch so its a little uncomfortable if baby pees or poos – which can help when teaching bubs to communicate. The timing catches are easy to get, are regular times, such as when she wakes up and after feeds or at nappy changes. The cue is the “sss psss” sound that lets your baby know when to go pee. The position is also a cue, as is running water. And the Erghhh erghh is the sounds we use for Poo. The signals come later when the baby can indicate with a voluntary action that he needs to go, such as moving towards the toilet place, using sign language, and later, speech. www.tribalbaby.org – a detailed account of one Australian family’s Nappy Free journey, every single step of the way. This is such a fantastic resource. NappyFree.com.au – An Australian site with a great DVD on Elimination Communication. They have a gorgeous DVD as well which you can check out the trailer here..
www.pottywhisperer.com – An American 2-disk informational DVD set covering all the basics of infant pottying, including how it works, how to get started, techniques and tactics, medical and professional opinions, contributions from parents, and resources. www.Timl.com/ipt -White-bouckepublishing.com – Laurie Boucke, Author of Infant Potty Training. 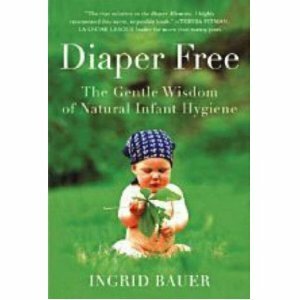 www.natural-wisdom.com – Ingrid Bauer, Author of Diaper Free, Natural Infant Hygiene. www.diaperfreebaby.org – Online international community of EC families, mentor programs, articles, advocacy support. www.thepottyshop.com.au – Sells the Elimination Communication books here in Australia. www.kindredmedia.com.au – A unique Australian magazine, formerly named Byron Child. Focuses on Sustainability, Connection Parenting and Intelligent Living. Grab your copy today! www.natureschild.com.au – Organic Baby Lifestyle shop. www.sarahjbuckley.com – Mother of four, G.P, Author, Natural birth advocate. A wonderful writer and thoroughly researched authority on pregnancy, birth and natural parenting. Excellent articles. www.groups.yahoo.com/group/OzNappyfree – an online community of old hands and first timers. www.parentingwithpresence.net – An inspiring site with articles on EC, Aware Parenting, & Non Violent Communication. The Potty Whisperer – simple explanation of IPT – debunks media ‘myths’. Born Potty Trained – a succinct explanation of EC, links to many news articles.